Is your preschooler refusing to eat anything other than chicken nuggets? Or would your toddler rather play than eat anything at all? If children’s nutrition is a sore topic in your household, you’re not alone. Many parents worry about what their children eat — and don’t eat. However, most kids get plenty of variety and nutrition in their diets over the course of a week. Until your child’s food preferences mature, consider these tips for preventing mealtime battles. If your child isn’t hungry, don’t force a meal or snack. Likewise, don’t bribe or force your child to eat certain foods or clean his or her plate. This might only ignite — or reinforce — a power struggle over food. In addition, your child might come to associate mealtime with anxiety and frustration or become less sensitive to his or her own hunger and fullness cues. Serve small portions to avoid overwhelming your child and give him or her the opportunity to independently ask for more. Serve meals and snacks at about the same times every day. You can provide milk or 100 percent juice with the food, but offer water between meals and snacks. Allowing your child to fill up on juice, milk or snacks throughout the day might decrease his or her appetite for meals. Young children often touch or smell new foods, and might even put tiny bits in their mouths and then take them back out again. Your child might need repeated exposure to a new food before he or she takes the first bite. Encourage your child by talking about a food’s color, shape, aroma and texture — not whether it tastes good. Serve new foods along with your child’s favorite foods. Add chopped broccoli or green peppers to spaghetti sauce, top cereal with fruit slices, or mix grated zucchini and carrots into casseroles and soups. Turn off the television and other electronic gadgets during meals. This will help your child focus on eating. Keep in mind that television advertising might also encourage your child to desire sugary or less nutritious foods. Withholding dessert sends the message that dessert is the best food, which might only increase your child’s desire for sweets. You might select one or two nights a week as dessert nights, and skip dessert the rest of the week — or redefine dessert as fruit, yogurt or other healthy choices. 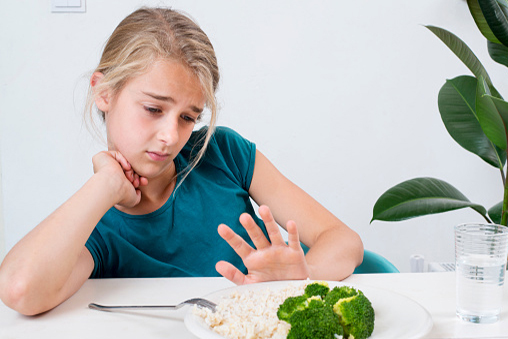 Preparing a separate meal for your child after he or she rejects the original meal might promote picky eating. Encourage your child to stay at the table for the designated mealtime — even if he or she doesn’t eat. Keep serving your child healthy choices until they become familiar and preferred. If you’re concerned that picky eating is compromising your child’s growth and development, consult your child’s doctor. He or she can plot your child’s growth on a growth chart. In addition, consider recording the types and amounts of food your child eats for three days. The big picture might help ease your worries. A food log can also help your child’s doctor determine any problems. In the meantime, remember that your child’s eating habits won’t likely change overnight — but the small steps you take each day can help promote a lifetime of healthy eating.